turnaround — Jay Williams Ph.D. 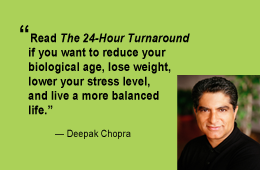 If you’re looking for a program that guarantees permanent weight loss, antiaging, and optimal health, The 24-Hour Turnaround gives you the information to make “Total Life Changes” (TLC’s) that will be effective within the next 24 Hours. Everyday you loose billions of cells and you make billions of new ones. What you do today profoundly affects your health, weight, and biological age tomorrow. With the information you would typically find in eight books – you learn how to combine ALL ingredients of weight loss and wellness into one program that works. No gimmicks – only the truth. TLC1: Master your mood and motivation. Gain new insight into how motivation, mood, and belief are essential for optimal health and a lean body. Use the Mastering Motivation technique to boost your willpower. TLC 2: Become your own personal trainer. Learn the H.E.A.R.T. workout-a unique and effective way to promote and sustain weight loss without overstressing the body. Walk or train using your personal Zone One prescription-and increase your fat-burning enzymes today. TLC 3: Learn the ABCs of the Definition Diet. Nourish and FEED (don’t starve!) your hormones, bones, cardiovascular system, muscles, and brain. Eat five minimeals of whole foods on the Definition Diet. TLC 4: Antiaging healing hydration. Start your personal hydration schedule right now-your healthy, hydrated cells will reverse aging, improve your skin, and promote weight loss. TLC 5: Unravel the myth of alcohol moderation. Skip your evening glass of wine, and increase your body’s ability to burn fat and remove toxins in the next 24 hours. TLC 6: Live longer, with sweet dreams! Go to bed ON TIME to make your own antiaging human growth hormone, boost your immune function, and even drop unwanted pounds-starting tonight. 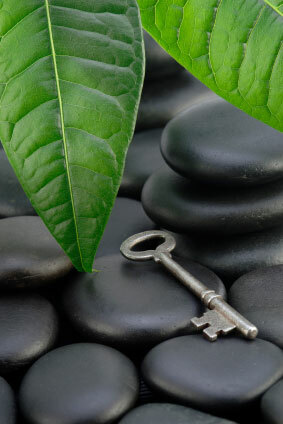 TLC 7: Balance your hormones-naturally. THE 24-HOUR TURNAROUND’s hormone-friendly whole foods, increased cellular hydration, antiaging exercise, and natural hormone balancers can give you amazing relief. TLC 8: Destress with mind-body innercise: Use your heart-rate biofeedback technique for “relax on demand” relief from stressful moments that raise blood pressure and cause aging and disease. 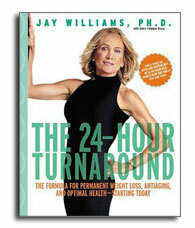 You can start making Total Life Changes now-while you’re waiting to receive your copy of The 24-Hour Turnaround! Follow the “Get Started Today” tips” on the TLC pages. Start a daily journal. An integral part of your program includes your Turnaround journal. Hello – this is not about just writing down your fat grams, but more importantly logging your stress level, attitude, hydration info, mood, quality of sleep, and more. All of the above effect weight loss, aging, and health. Read page 17 to learn more. Click here to download a daily journal page. Collect the necessary equipment to begin the TLCs. You will need a tape measure, a good pair of Athletic shoes, a nutrient counter that lists fat and fiber, and a Heart rate monitor. The heart-rate monitor is the secret to the success of your H.E.A.R.T. workout. Check with our Marketplace to find the above.